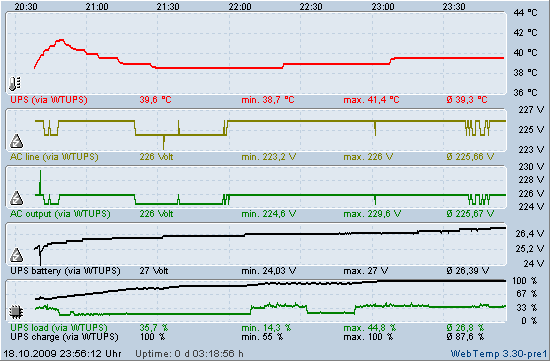 This (windows) project enables WebTemp to display UPS data (line voltage, load, battery voltage and temperature). At the moment WTUPS supports PowerWalker UPSs on COM and USB ports and also models made by APC on USB ports. The port the UPS is connected to is detected automatically. The software reads line and battery voltages and load percentages directly from the device. 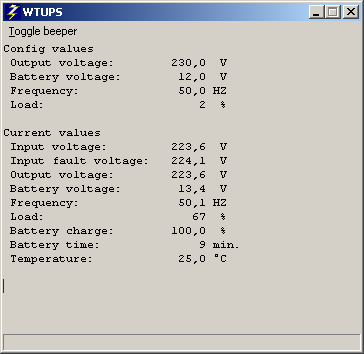 My PowerWalker UPS, however, reports a bogus temperature value which stays at 25 degrees Celsius all the time. Battery charge and remaining time are estimated values. WTUPS offers the execution of three event-driven batch files with the names "OnACFail.bat", "OnBatteryLow.bat" and "OnACRestored.bat". You can use these files to start any other tools of your desire. This command will shut down the local system in 3 minutes from now. Now, why would we do that? Why would we wait 3 minutes before shutting down the system. Well, power outages often last for only seconds or minutes. Server environments should be as reliable as possible. And we can cancel a running timeout (read on). So we'll better wait 3 minutes and only if the power is still gone the system is allowed to shut down. You can- of course- combine as many command lines as you need (and e.g. trigger a backup).